Laurie Here - Contemporary Fiction and MORE - Book Reviews: "Fall Into Reading 2012" Wrap-Up Post! 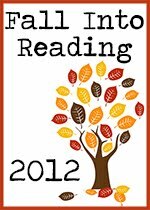 The "Fall Into Reading, 2012" started on September 22nd, and ran through December 21st, 2012 this year. This has been sponsored by Callapidder Days! Thank you! So this is what I am doing! Next you will find the list I originally posted, and what and where I am today! Again, this started on September 22nd to December 21st, 2012, which is Fall. Now that the Fall is over, and Winter has settled in, it is time to do this wrap-up post and see how we did! I 'have' come back and edited the original post as I have read some of the books, added new ones, and more. Here is a copy of the original list with edits. I really got into reading Christmas books, and enjoying others' celebrations, as my own life's celebrations are ever changing, and this was a GREAT way of dealing with all of my personal challenges/changes. Although, it still hurts to not have what we once had, as each Chapter of our lives change, and as many of you who are older and have experienced more life than others truly know this all too well. Good and bad. I should rephrase that: enjoyable and the not-so-enjoyable. How's that?! I have read a LOT of Christmas books! Wow! I have read a LOT of Christmas books on my Kindle! Can you believe, (yes, you can! ), I have MORE! Oh, yeah! We'll just see how many I CAN get read! Watch my blog! 12. A Home for Lydia by Vanetta Chapman - I needed to buy this one, BUT, I also got it from NetGalley! LOL! So I have 2 copies! I look at it this way - I'm helping to INCREASE the Authors' salaries! LOL! (I am in an Amish Challenge, and I think this will take care of ALL my Amish books I am supposed to read! I think that Challenge has 15 Amish Books to read for it. I alwahs LOVE to read about the Amish! I have some books by some of my favorite authors, too! However, Melody Carlson is one of my favorite authors, too, and I saw she has an Amish Christmas books, too. I should grab that book while I can! 14. *DONE!! * Deception in Paradise by Deborah Brown - I'm not ready to write the review YET, so I have NOT marked it as READ yet on Goodreads. 22. *DONE!! * Sister Wives by Cody Brown and his Wives (The Fundamentalist Mormon Polygamist family that I've watch on TV - a Reality TV show - on TLC - The Learning Channel (or is this becoming "The Looney Channel"? LOLOl!!!) and although I struggle to understand it, I did buy this book because I am curious as to HOW the wives can 'share' a husband? Not to mention, they have 17 children, and with the purchase of the book, it would help to buy their book and to help in that way. NOW THERE'S ANOTHER POLYGAMY SHOW ON TLC, TOO! I can't remember the name, but . . . what is this? Everyone move on over to Polygamy? Okay, so that's MEN with MORE than '1' wife - What about WOMEN WITH MORE THAN '1' HUSBAND? COME ON!!! Okay - Hubby said something! Here it is: MALEGAMY!!!!! GREAT ONE!!!!! I LOVE MY HUSBAND!!!!! No! I REFUSE TO SHARE HIM!!!!! LOLOLOL!!!!!!! I LOVE some of the other shows on that station, too, such as 19 Kids and Counting, and others. Others, I dislike very much. Whatever happened to United Bates of America, AND The Little Couple? Where did these shows go?? And my MOST favorite, Little People, Big World WAS back! I guess it will be back every now and then. Every family on this earth has struggles, but these people embrace life, and the ones with disabilities (I have one, so perhaps that is what attracts me to some of the shows?) really make a wonderful life with what they have been given! Oh! Plus the NEW show, Abby and Britney - the conjoined twins! LOVE it! It's super neat to watch how they work together! 5. *DONE! * Midnight Cravings - Book One of The Eternal Dead Series by Joelle Sterling - I WAS "NOT" HAPPY WITH RECEIVING THIS BOOK FROM THE PUBLISER! This book is WAY OUT of the genres I read! The Publisher did NOT make clear what this book was about, just that is was Young Adult, and in MY OPINION, EROTICA IS "NOT" Young Adult! I was VERY upset, to say the least! The Thieves of Legend by Richard Doetsch - From the Publisher - Atria Books - Honestly, I will NOT get to this book until AFTER the 1st of the year. Oh, this next book is SOOO funny! It's a HOOT for those who 'might be' middle age! LOL! 2. The Unwords by The Unauthor (This is some pretty heavy poetry that you have to think about. I'm taking several days at a time to think about what this author has to say. Check this book out. I'm serious about this. He is a SUPER NICE GUY to talk to, and has some SUPER GREAT things to say in his poetry. I don't want to just blow through this book, but take my time and really let what he says sink in. TO READ "OR" FOR ANOTHER CHALLENGE! TOTAL BOOKS READ FOR THIS CHALLENGE - "20"! Woo-hoo! Katrina??? Up for it??? LOL! Spring, right?